From a buyer’s standpoint, it’s good to avoid a bidding war for a property. To do so, it helps to understand one of the tactics which can be used by a seller’s agent: delayed consideration for offers. 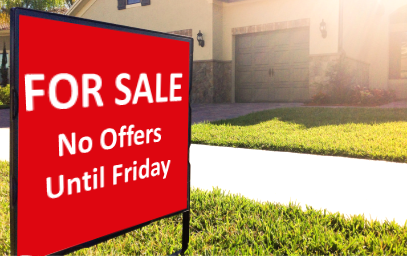 During the hot real estate market in Toronto last year, lots of houses were listed with an announcement something like “no offers until Friday at 2 pm”. Typically, such homes were listed well below market value, sometimes hundreds of thousands of dollars. Sellers hoped to get wide attention with outrageously low prices in the hope of attracting enough buyers to start a bidding war. As realtor Nicole Harrington pointed out in a recent article on the Toronto real estate site Move Smartly, this tactic can backfire if the house is actual priced at market value (rather than an artificially low value). People can see the seller’s agent is trying to start a bidding war, but because the starting price is already high, buyers may be unwilling to play the game. Prince Edward County sellers used this “list low & start a bidding war” tactic infrequently at the height of the market last year. Ironically, we are now starting to see it more often as our market cools down and buyers are less in a frenzy. If you’re a home buyer, how should you respond to this selling tactic and avoid a bidding war? First, if the house is priced close to market value, you may want to watch without submitting an offer. If the house is still on the market after the offer date, it means the seller didn’t get a bidding war. They may now be more interested in a reasonable offer. Also, when a listing says no offers will be considered before a certain date, you can still submit an offer early. In fact, there’s a special term for a sizeable offer that’s made before the auction date. When a buyer tries to force their way to the head of the line with money to avoid a bidding war, it’s called a “bully offer”. Unless the seller has given the listing agent clear written instructions to the contrary, the seller’s agent has a legal obligation to present any offer to the seller as soon as possible. The seller doesn’t have to consider an early offer, but they can. On top of that, if they do consider it, they can legally accept it without waiting for the auction date. The term “bully” conjures up a negative image -especially for Canadians- but such offers are perfectly legal. Maybe pre-empitve offers is a better term. “Pre-empting the auction” sounds much better than “bullying your way to the head of the line”.